At last, a large and lovely bouquet that says it all (and then some). 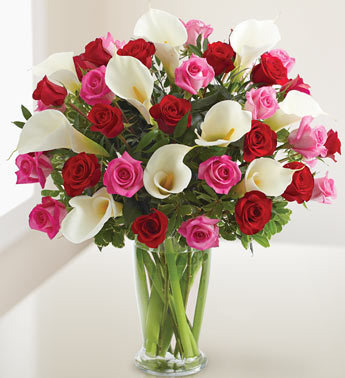 Passionate premium long stem red roses, romantic premium long stem hot pink roses, and stunningly beautiful white Calla lilies, hand-designed in a premium clear glass vase. Couldn't have said it better ourselves. Three heartfelt surprises - one truly enchanted evening! This irresistible Valentine’s bundle starts with our beautiful gathering of blooms in shades of lavender & pink. And because one great gift deserves another, we’ve paired our flowers with a huggable teddy bear and delectable chocolates. It’s everything you need to surprise a Valentine’s sweetie. Bear & chocolates assortment may vary due to availability. Inspired by the enchanting fields of the European countryside, we’ve artistically gathered radiant red and hot pink roses, lovely pink lilies, sweet pink Gerbera daisies and more inside a classic clear glass vase. Accented with a charming pink satin ribbon, it’s a beautiful and romantic surprise for someone very special! Presented by Bloomnet. Surprise your Valentine again and again (and again!) with three romantic gifts in one. We’ve paired our gorgeous bouquet full of lush red & pink blooms with a huggable teddy bear and decadent chocolates to keep the hugs & kisses coming. All-around arrangement with red and pink roses; pink Stargazer lilies, Gerbera daisies, Peruvian lilies (alstroemeria) and limonium; accented with assorted greenery. Bear and chocolate assortment may vary due to availability.